Over the past year, a Virginia-based company has been helping Unalaska get rid of millions of pounds of scrap metal. They’re finally nearing the finish line, and now, they’re looking to expand to nearby islands. 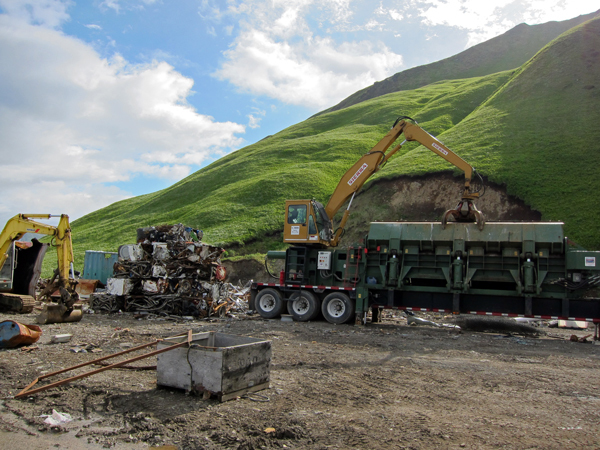 It’s a problem that Unalaska has been dealing with for years – how to get rid of the huge volumes of unwanted scrap metal that pile up around the city. Shipping anything off of the island is expensive, and given the low price of scrap metal, it’s been hard to find a company that thinks it’s worth it. “I think if it was a non-family business coming up here, I doubt they’d be able to do it,” says Richard Moore. He’s the son of Ron Moore, who owns a scrapping company based out of Norfolk, Virginia. The Moores approached the city last year with an offer to help, and got a $60,000 contract in return. In March 2012, the whole family moved to Unalaska to begin collecting, removing, and selling scrap metal. Richard Moore says they ended up staying much longer than expected. “We originally planned to be here for about three months and we’re still here. It started [out] a clean-up project and now just more scrap just keeps generating and we haven’t got a chance to get it all cleaned up yet,” says Moore. Moore estimates that his father’s company has shipped 200 to 300 loads, totalling eight to nine million pounds of scrap metal. That includes around 600 crushed vehicles, as well as old processing machinery, boat trailers, yard equipment, and home appliances. City officials estimate that 70 to 75 percent of the island’s scrap has been removed since last summer. But there’s still more to be done. The family plans to stay in Unalaska for another year or so before heading east to Sand Point to do a similar clean-up. Moore says that after that, they’ll take on other communities. “Actually, we’d like to clean up the entire Aleutian chain, to tell you the truth. We’re going to try to get everybody cleaned up for years to come,” says Moore. But although demand is high, Ron Moore – that’s Richard Moore’s father – says metal scrapping isn’t a very lucrative endeavour in the Aleutians. At least not for now. With the variable pricing of metals, Moore says it’s a huge gamble to rent land in Alaska to store the scrap while waiting for prices to go back up. But he says he can afford to eat the losses thanks to reduced shipping rates from Samson Tug and Barge – the company responsible for transporting Moore’s collected scrap from Unalaska down to Seattle. So while Moore isn’t making a fortune recycling metal in the Aleutians, he says he’s sticking around on principle. Which means that Moore might be around for quite a while. Without a longer-term solution to the problem of scrap metal accumulation, Unalaska will probably be needing his services again in the near future.